Celebrating his 10 years in showbiz, Kapamilya actor-singer Matteo Guidicelli is inviting everyone to watch his concert in his hometown Cebu. Dubbed as Matteo Made In Cebu, Guidicelli’s 10th anniversary concert will be held at the WaterFront Cebu City Hotel & Casino on November 18. 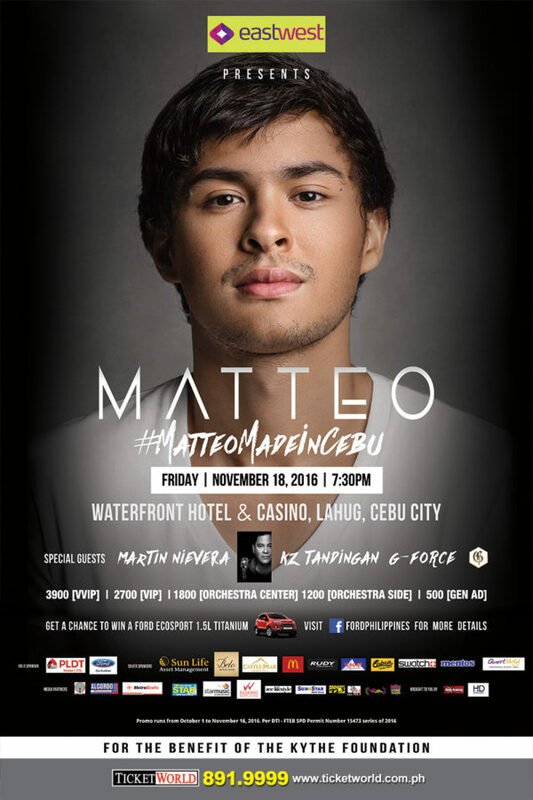 Matteo Made in Cebu will be held at the Waterfront Cebu City Hotel on November 18. For ticket reservations you may visit or call TicketWorld at (02) 891-9999 or 222.ticketworld.com.ph, Waterfront Hotel and Casino at (032) 232-6880, Ayala Center Cebu Concierge or SM City Cebu Ticket outlets. Matteo Made In Cebu is a benefit concert for Kythe Foundation, a non-profit organization helping kids with cancer. Here’s your chance to win a brand-new Ford EcoSport! On November 18, 2016, Ford will be raffling off a Ford EcoSport at the “Matteo Made in Cebu” concert that will be held at the Waterfront Hotel and Casino, Cebu City. All ticket holders will have a chance to win a brand-new Ford EcoSport! Promo period will be from October 1 to November 16, 2016. The promo is open to all ticketholders of Matteo Made in Cebu concert, to be held on November 18, 2016, 7:30 PM at the Waterfront Hotel & Casino, Lahug, Cebu City. To qualify, visit Ford Alabang or Ford Cebu and test drive a Ford EcoSport within the promo duration. Test drive once per ticket purchased to earn a raffle entry. After completing the test drive, register your details at Ford Alabang or Ford Cebu. There will only be one winner of the Ford EcoSport. Raffle entries can only be earned upon completion of test drive and registration. Deadline of submission of entries is on November 16, 2016, 11:59 PM. The winner will be drawn via electronic raffle draw on November 17, 2016, at 4:30 PM.